Downtown Las Vegas Events Center will be the home to some of Rock’s biggest names on April 21st and 22nd. The first annual Las Rageous Music Festival will be a two day festival headlined by Godsmack and Avenged Sevenfold. Other bands attending will be Coheed and Cambria, Anthrax, Killswitch Engage, All That Remains, Mastodon, Breaking Benjamin, and much more.The festival will include Las Vegas’ top food trucks and freak show performers to create an atmosphere that Downtown Las Vegas has never seen before. If you love rock music, this festival is a must. Many of the bands on the bill have released or will release new music this year, this is your chance to see your favorite bands perform some of their classic songs with brand new material. The lineup is a mix of rock veterans who always deliver a great set and a good time. The event takes place during one of Las Vegas’ best months, April. Why not make an entire weekend out of the first annual Las Rageous Rock Festival?You can stay at the Plaza Hotel Casino for less than the cost of an Uber or Lyft ride. Enjoy your entire weekend without having to worry about getting home or fighting after-concert traffic. Taxis and ridesharing apps might be convenient, but can also be expensive. Uber/Lyft are also very cautious about accepting fares from intoxicated passengers. The Plaza Casino Hotel is surrounded by great entertainment. The Fremont Street Experience is home to some of Las Vegas’ best restaurants and most entertaining attractions. Located inside the Plaza Hotel Casino, Brightside Breakfast and Burgers offers guests an authentic New York style deli with traditional breakfast items, speciality and made-to-order sandwiches, burgers, and salads served all day. Brightside also offers some signature dishes such as our Avocado Toast, which is made of thick cut toast topped with avocado, tomato, goat cheese, and basil.Whether you are looking for a late breakfast or an early lunch, Brightside Breakfast and Burgers has you covered. The Plaza is also home to a rooftop pool. The newly renovated pool deck provides guests with over 70,000 square feet of relaxation and entertainment. Prepare for a rocking weekend by lounging in style on our rooftop pool and enjoying one of the largest pool decks in downtown Las Vegas. New additions to our rooftop pool include a refurbished wet deck, recreation facilities, and an onsite food truck. Our pool also offers six brand new cabanas to provide guests with a private poolside retreat. Each cabana has its own TV, fan, and refrigerator. Not in the mood for a swim, but still want to hang out on the deck, we offer a recreation area with tennis, basketball, and Pickleball. Visit the world famous Fremont Street Experience, which is a 24-hour mall featuring a huge LED canopy, casino & restaurant access, and free live entertainment. SlotZilla, a 12-story slot machine inspired zip line attraction. Fly high above the Fremont Street Experience as you whiz by some of downtown’s most famous neon signs at nearly 35 miles per hour. You can also enjoy world-class shopping at the Downtown Container Park. The Container Park is an open-air shopping center filled with boutique retail shops, restaurants, and live entertainment. Keep the party going long after the music stops by visiting some of downtown Las Vegas’ premiere bars. Downtown Las Vegas offers some of Las Vegas’ most popular bars including Commonwealth, The Griffin, and the Beauty Bar. Each bar has a unique vibe and their own twist on drinks. Downtown Las Vegas offers amazing street art. When you walk around downtown Las Vegas, you can’t miss art murals decorating the walls and street. The Plaza Hotel Casino joins the art installments at downtown with two massive murals on the side of the hotel. Shepard Fairey, completed his masterpiece, “Cultivate Harmony”, on the Plaza Hotel in February 2017. Fairey is known for the iconic 2008 “Hope” poster from Former President Barrack Obama’s initial White House run. Fairey’s piece reminds us that peace and harmony are the only way to maintain what sustains us. Fairey is one of the most recognized street artists of our generation and the Plaza Hotel Casino is proud to be home to one of his latest art installments. Shepard Fairey isn’t the only renowned artist transforming the Plaza Hotel Casino. 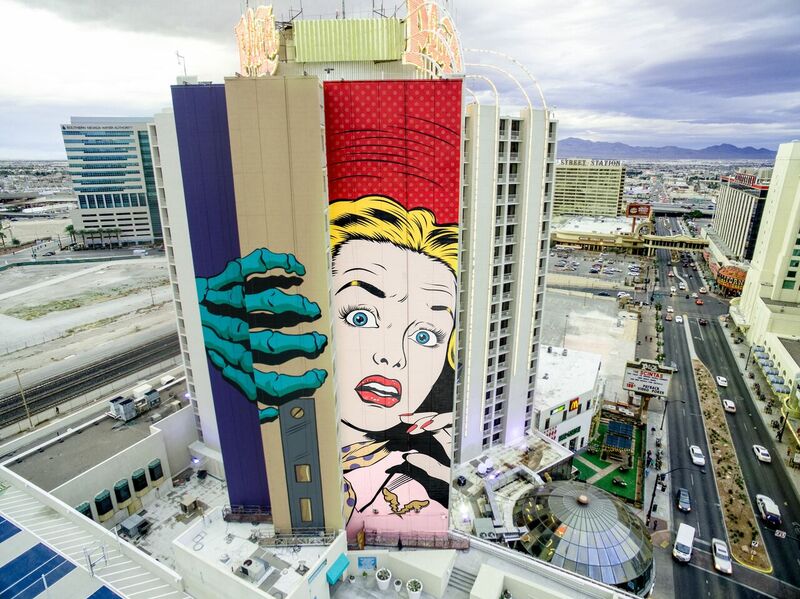 English artist D*Face unveiled his art mural shortly after Shepard Fairey and brought his own unique style to the Plaza Hotel Casino.D*Face’s influences include hip-hop, punk rock music, animated cartoons, and fellow street artist, Shepard Fairey. His influences can be seen in his art, which uses mediums like spray paint, stickers, posters, and stencils to create beautiful modern pieces of street art. Downtown Las Vegas Events Center (DLVEC) is home to Las Vegas’ best outdoor festivals. Located in the heart of downtown, the DLVEC has taken the party atmosphere of Fremont Street and compressed it into one amazing venue.The Downtown Event Center is located at 200 S 3rd St., minutes away from the Plaza Hotel Casino. Parking at the Downtown Las Vegas Events center can be challenging. Street parking is limited and metered, parking tickets can usually be found on many vehicles taking the chance at timing concerts. We recommend parking in our self-parking garage. The fee is far less than a parking ticket and our parking lot exit drops you off on Main Street.